At the Forever Museum of Contemporary Art, Gion-Kyoto (FMOCA), we strive to expose people to a living, breathing tradition that fuses both time-honored and present-day culture. 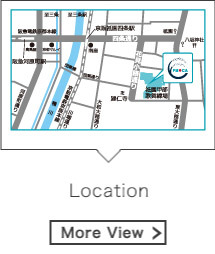 We are located inside the Gion Kobu Kaburenjo Theater, a well-known hub of traditional Japanese culture. Specifically, we operate our contemporary art museum out of this facility’s Yasaka Club, which was completed in 1913 and is registered as a tangible cultural property. FMOCA’s exhibition areas, housed in spaces fitted throughout with tatami mat flooring that express the appeal of traditional Japanese architectural design, bring together both traditional and contemporary culture, offering a novel art experience for visitors to enjoy. Prior to its opening in Kyoto, the Forever Museum of Contemporary Art (FMOCA) operated for ten years out of Akita City. On June 10, 2017, we opened the current FMOCA in Gion (south side), a city-center district in the Higashiyama Ward of Kyoto. The museum is housed in the Yasaka Club, part of the Gion Kobu Kaburenjo Theater built in 1913 and known for its famous Miyako Odori dance performances. The Yasaka Club is a traditional Japanese structure built 104 years ago, and it is registered as a tangible cultural property. We have decided to use this modern hub for the propagation of the highly refined and celebrated Kyoto-based Inoue School of dance, an important facet of Japanese traditional culture, as the home of our contemporary art museum, although we will only be here for a limited run of several years. By transforming the traditional cultural facilities at Gion Kobu Kaburenjo Theater into a contemporary art museum, we hope to fuse both the traditional and the contemporary and thus bring a new type of culture to the world. History shows that Japanese culture has been formed and developed by adding innovative outside elements to traditional culture, and we hope that this latest opening of our museum in Kyoto will help to foster new facets of Japanese culture, even if just in a small way. Based on this approach, our goal at FMOCA is to offer novel contemporary art exhibitions and a new way of viewing such exhibitions, rooted in a foundation of Japanese tradition. 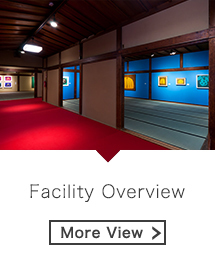 The new viewing style entails holding exhibitions in rooms with tatami mat flooring, on which visitors sit when viewing works. Japanese architecture traditionally uses shoji and fusuma wood-and-paper screens to partition off rooms within the structure, which is why we have chosen to display works of art in the tokonoma alcove areas of rooms while adding paintings to the fusuma partitions themselves. In fact, this facility was originally designed with fusuma installed for use as contemporary art display walls, which is why they are fitted with wall papering in traditional Japanese colors. Although contemporary art exhibitions are, due to their Western roots, usually designed to have visitors view works from the standing position, FMOCA in Gion, Kyoto is laid out in a way that enables visitors to sit on tatami mats while viewing the displays? accordingly, the works of art are installed at lower positions than normally seen in contemporary art museums. We believe that this novel viewing style, which adopts a uniquely Japanese way of viewing works, has the potential to foster new types of interactions and connections between viewers and the contemporary artwork on display. Here at FMOCA, we have spent more than 30 years collecting the nearly 700 works of art now in our possession, of which almost 60% are pieces by Yayoi Kusama. In order to provide a comprehensive overview of Kusama’s body of work, we worked together with the artist herself to build the FMOCA Yayoi Kusama collection, which contains everything from her early works to art from recent years, with a central focus on the years during and surrounding the 1990s. This collection includes A Boat Carrying My Soul (1989) from the Fuji Television Gallery’s individual-artist exhibition displaying Kusama’s prominent new works and the 1991 Between Heaven and Earth Exhibition; My Solitary Way To Death (1994) from the My Solitary Way To Death Exhibition also held in 1994; and Yellow Trees (1992), the main piece from the Nagano Prefectural Shinano Art Museum’s 1994 individual-artist exhibition. All of these are important nineties-era Kusama works, and we periodically lend them out to the Tate Modern and other art museums and galleries domestically and internationally. We also possess some of her earlier works, including Light from the Ends of the Earth (1950) and Infinity Nets (1963). In addition to this unique group of Kusama works, our collection includes 352 of her 372 print works (not including Love Forever), which account for about 95% of the pieces she produced in this medium. As a result, FMOCA’s collection provides a wide-reaching overview of Kusama’s artistic works and endeavors from 1979 to 2016. In addition to Kusama, our permanent collection includes works from other artists both from Japan and other countries, including Joseph Beuys, Anselm Kiefer, Richard Long, Tatsuo Miyajima and Oscar Oiwa.